Less than a month ago when we looked at the performance of the most-shorted stocks, we confirmed that at least from a price action standpoint the short squeeze that had started in early February on the back of the 50% move higher in oil, had become the biggest short squeeze on record. Now courtesy of JPM's Prime Brokerage, we can not only confirm that the move higher from the February lows was the biggest squeeze ever, but share a unique glimpse inside its mechanics, where something surprising emerges. 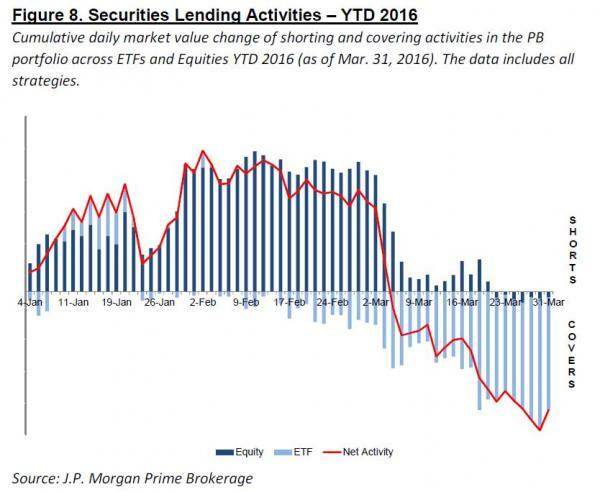 The chart below shows the cumulative daily market value change of shorting and covering activities in the PB portfolio across ETFs and Equities YTD 2016 (as of Mar. 31, 2016). The data includes all strategies. There is something very surprising about the chart below: what it shows is that whereas hedge funds have been actively shorting single name stocks, when it was time to cover, the single names remained shorted but it was ETFs where the covering/buying activity took place. Potentially, this huge ETF covering spree (during which no actual short equities are covered) is a function of pre-existing short ETF positions, used as short pair-trade hedges to maintain a "market neutral" position with single name longs; then during turbulent market inversions, it is the ETFs that are covered first and foremost, while existing shorts remain outstanding, something which would dramtically change the interpretation of such conventional metrics as NYSE short interest. What are the implications of this asymmetric long/short exposure, where hedge funds short single name stocks and cover ETFs, is not fully clear at this moment but it appears to be an odd development of market technicals and may explain why whenever there is a "Buy The Dip" rally, the cross-asset correlation tends to be far higher on the way up, than on the way down.